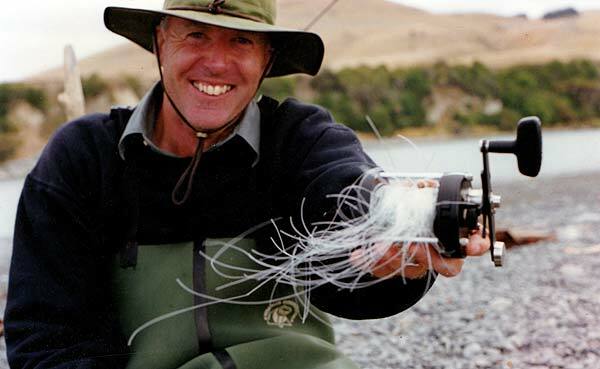 A nasty birdsnest after casting with your baitcaster salmon reel. Some are easier to unpick than they look. 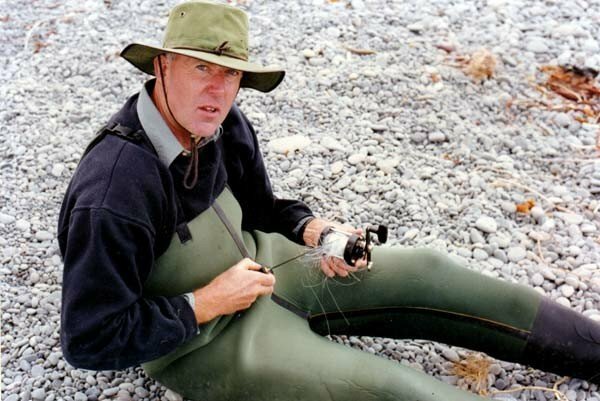 One of the most annoying things that can happen to any salmon angler is a horrid over-run or “birds nest” during a cast. It always seems to occur just when the salmon are biting and both of your mates have a fish-on! Sometimes it looks worse than it is. A little careful “picking” can sometimes work wonders. At other times it is hopeless and all you can do is cut the line off. You can get a “birds nest” with any make or model of free-spool bait-casting reel. It can be caused by allowing loose coils of mono to become trapped under later winds of mono. Always check that your line is tight on the spool before you begin to retrieve by gently pulling the line tight with your hand above the reel. You will also get birds nest when you line is becoming old and worn, or if your reel isn’t setup correctly. The answer is to always carry a spare reel if possible. At the very least you should always carry a spare spool so that you can make a quick change in the event of a tangle. 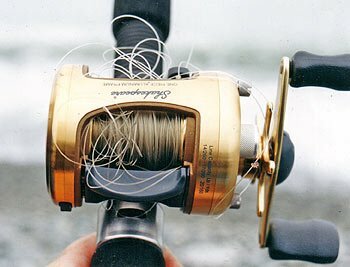 You can greatly lessen the chances of a birds-nest by tightening the knob on the end of your reel. This reduces the sideways “float” of the spool and causes a little friction to ever so slightly retard the spool from spinning freely. Do it up too tight and you reduce casting distance. So it is a trade off between the two extremes. Some birds-nests can be unpicked by turning the spool back and forth while pulling off line. However some are stuck in so many knots it is easier to cut the line free. Many salmon anglers who like to cast out a very long distance over the surf remove some, or all, of the casting blocks from their Abu 7000 and 7500C bait-casting reels. 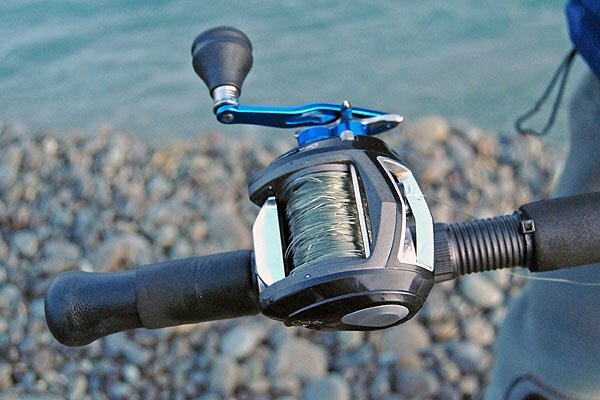 This speeds up the reel and increases casting distance – obviously at some additional risk of a tangle-up. Generally speaking you can get away with a very free running reel when casting with a tail wind because the wind is taking your lure away from you. Whereas when casting into a head wind you need to be a bit more cautious because the spinner can “hold-up” especially in strong blustery wind. The last thing you want is line coming off your reel faster than your lure can take it away! Still smiling. 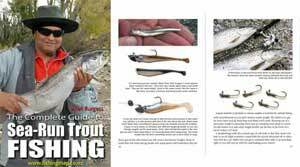 If haven’t had one of these you might not be a true salmon angler yet! What an awful tangle. The reel looks to be an Abu Seven Sprint. But this can happen with any bait-caster reel. I find that it is best to use 20 lb (9.1 kg) monofilament line of .45mm diameter for distance casting on my Abu 7000. Thinner monofilament line might allow you to pack more on the spool but also seems to result in more stretch and tangles. I have long fished with Maxima monofilament which is very good. However I regularly use cheaper lines as well. These work just as well. I note that several anglers I have met at the beach are distance casting with braided lines. This is very fine in diameter. At least it is thinner than 20 pound Maxima. Unlike mono braided lines have practically no stretch. These braids are also much more expensive than monofilament. They appear to work fine. I have used them on a baitcaster for salmon for a while and then changed back to mono. A birds-nest in braid is very difficult to un-pick and much more costly if you end up cutting the line to clear the tangle. Though braid has become much less expensive nowadays. Modern Abu Revo Toro with a birds-nest. It can happen with any bait-caster reel and to the most experienced of anglers.